we are on the second time around that PSI is lost because the rubber grommet edge on the inside of the rim starts to break and allows air to seep out. We had all of the grommets replaced in Ocoee,FL at Crawford Tire...a great place to go (they do the area school busses and lots of 18 wheelers). They put in truck stems, got rid of all of those various woven fabric like connecter, and the stems were long enough to come through the simulators for easy air-ups. Now we are experiencing the same problem..one tire at a time. 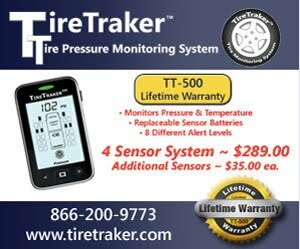 All is well when we check them, then it can be as little as 15 minutes down the road that we stop for somthing, check the gauges and a tire is down 15 lb. or more. Bottom line, it can be more than just the valve stem or core. Mr Mulder, Interesting problem. I know that some rims have different diameters and thickness requirements for the grommets but would expect a truck tire center to select the correct ones. If there is air loss only when driving I would suspect tire to wheel fit or a cracked rim. If more than one tire looses air then I would eliminate cracked rim as probable cause. How old are the tires? If they are approaching 7 to 10 years the bead rubber could be too hard to compress and form a tight seal to the rim. You can try and confirm this if you lay the tire/wheel on its side and with soap/water sprayed on the tire-rim interface you can try and jump on the tire to see if any air leaks out. For diesels with airbags. Place blocks under all four jacks within about 2 inches of the jack pad. 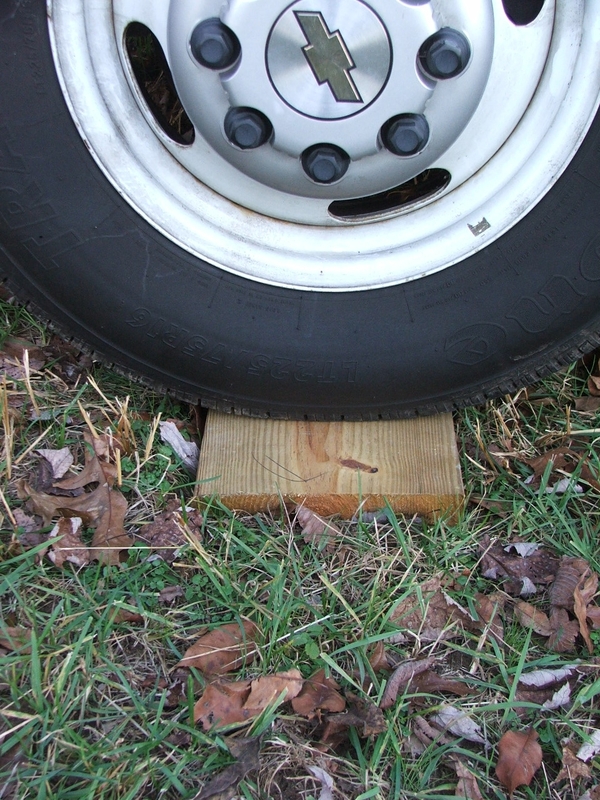 Release air pressure and allow the motor home to sellle on the blocks thereby releasing pressure on the tires. Bob. I will agree that I don't have an exact comparison. I don't have a test budget to go out and buy some black or tan tire covers. I have offered to do a new comparison if some manufacturer would provide one each for a strict comparison but no one has made an offer yet. If you, or someone you know has a temperature gun and dark cover I would be interested is seeing a temperature comparison of covered vs no cover comparison in full sun. It does take a couple of hours to reach a stable temperature. Despite the fact that my test wasn't "pure" I still stand by my recommendation that white covers be used to decrease the tire temperature which will also improve tire longevity. I'm curious why you feel that storing a tire on sand is a problem. Real sand is inert, nothing but silicon dioxide, and dry because it drains so well. Now I'm talking real sand, and not just sandy loam or other mixed soils. In Florida, where I live and park my coach, I think the white sand is actually a superior surface for storage. I also wonder about the advisability of using any sort of pressure-treated wood under a tire. If chemical leaching is the concern, PT wood would seem to be a very poor choice. It is laced with metal-based chemical preservatives such as arsenic,copper, chromates and sodium-borates that are well-known to leach into surrounding soils and materials. Some heavy-duty types of PT wood may even use naptha or creosote as the preservative. The preservative in the light-duty PT wood commonly found in local lumber yards is also quite alkaline, and that can't be a good thing either.This stuff is often corrosive, to the point where the PT wood manufacturers recommend using only galvanized or stainless steel hardware with PT wood. Oil in tar can attack the rubber but I think arsenic and other chemicals are to low in concentration to attack the rubber or steel. Rubber is not affected by mild alkaline. I read elsewhere that increasing the sidewall cold max PSI by 10 would also help prevent flat spots during long storage. Do you agree? As for me, I lift the entire trailer off the ground with my Lippert 6-Point hydraulic leveling system.